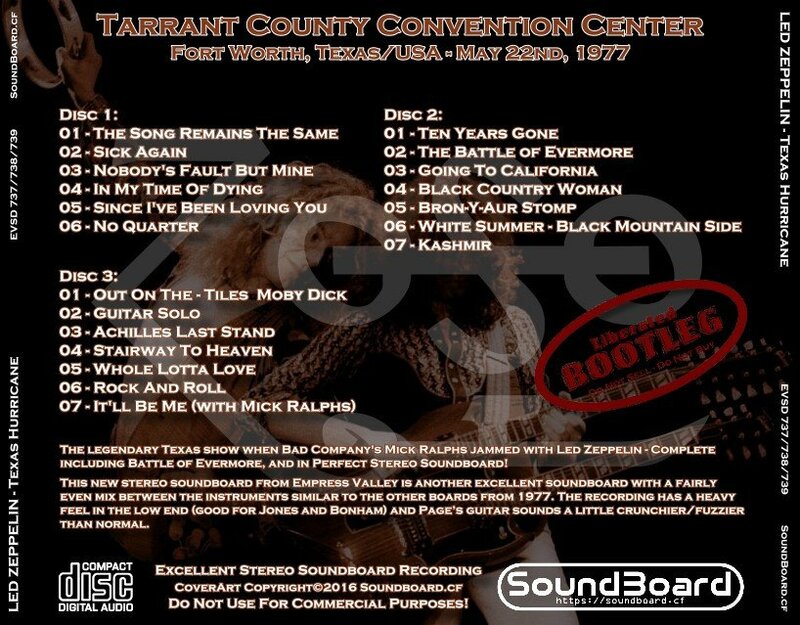 The legendary Texas show when Bad Company's Mick Ralphs jammed with Led Zeppelin - Complete including Battle of Evermore, and in Perfect Stereo Soundboard! Led Zeppelin’s concert at the Tarrant County Convention Center during their North American tour in 1977 has circulated with three distinct audience sources. The earliest CD versions, Polished Performance 1977 (Pot), Song Of The South (Capricorn), and Unbooted (Tarantura) were all incomplete, coming from a single source and contained only about an hour from the end of the show. It’ll Be Zep (Silver Rarities), Complete Tarrant Concert (Wendy) and Jamming With Mick Ralphs (Empress Valley) all use mixes of the three audience sources to present the longest possible version of the show. This new stereo soundboard from Empress Valley is another excellent soundboard with a fairly even mix between the instruments similar to the other boards from 1977. The recording has a heavy feel in the low end (good for Jones and Bonham) and Page’s guitar sounds a little crunchier/fuzzier than normal. Led Zeppelin was a little over a month and a half into their tour and “The Song Remains The Same” sounds very tight. Sometimes Zeppelin needed a couple of tracks to warm up before hitting full stride but tonight they get into it quickly. Plant addresses the audience after “Sick Again” and the band rolls into the first track from the new album, “Nobody’s Fault But Mine”. The start of “In My Time Of Dying” is stopped and has to be started again due to Jimmy’s guitar cutting out. This is a great version with the simple exception of a near train wreck during the coda. Page starts playing a few bars behind the rhythm section and it is rather hilarious at how long they go on before finally reconnecting. “Since I’ve Been Loving You” redeems with some nice “light and shade” moments and they all turn in some fine English blues. “No Quarter” is typically excellent with great interplay between the musicians and during John Paul Jones’ lengthy piano solo they break into a loose version of “Nutrocker” which keeps up the excitement. Page has some magical moments in his solos. Disc two starts off with Jones on his triple neck acoustic. We are now able to hear the complete “Ten Years Gone” and “The Battle Of Evermore” which were sadly missing from the audience sources all these years. Jimmy’s execution of the main solo in “Ten Years Gone” is very nice. The 1977 tour featured a long four song acoustic set and Plant offers a “cross-section of the acoustic stuff that we’ve done…trying to break the name of heavy metal” as he puts it. He talks of the border struggles in English history before “The Battle Of Evermore” adding “and I believe you Texans had a bit of trouble with that too”. He describes “Going To California” as more American than English and throws in “it must have been a Yellow Rose” in reference to the “flowers in her hair”. “Black Country Woman” runs non-stop with “Bron-Yr-Aur Stomp” which is unfortunately cut after only 1:17 and in return misses the first minute and a half of “White Summer” as well. “Kashmir” storms across the stage and is interesting as Bonzo throws in a couple extra fills in a few spots even though the Mellotron sounds slightly out of tune in places. During Plant’s extended introduction of John Bonham, Page perfectly plays the opening lick to the “Heartbreaker” solo and clearly rouses the audience before the “Out On The Tiles” intro (It sounded so good it even got me excited). “Over The Top” is definitely the best way to describe this, Bonzo’s playing is monstrous from the start and he continues for a staggering 25 minutes or so. The electronic trickery during the tympani section sounds like a motor speedway at times. Page’s guitar solo follows. I have always found the effect he uses very noisy and the solo very boring up until the violin bow section. Perhaps you had to be there. Page has some trouble with his tuning in “Achilles Last Stand” but he does his best to mask it. Bonzo is on fire again here but it is not enough to keep it from being a mere average performance. “Stairway”, on the other hand, is epic on every level and Page has a nice solo break before bringing the main set to a close. “Whole Lotta Love” (featuring a prominent backing vocal from Jimmy) makes its tour debut tonight. It is used as a brief intro to “Rock And Roll” where Bonzo teases the drum intro many times before committing. If this isn’t enough, the band returns for a second encore and feature a cover of Jerry Lee Lewis’ “It’ll Be Me” with Mick Ralphs from Bad Company on second guitar. A rare Zeppelin moment. 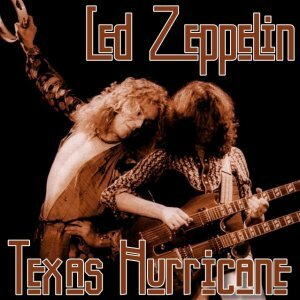 Texas Hurricane is another excellent Zeppelin soundboard that is sure to please collectors. Texas Hurricane 0 out of 5 based on 0 ratings. 0 user reviews.